Biomimicry Oregon, in partnership with the Pacific Northwest College of Art (PNCA), White Cloud Press, and Oregon BEST, produced two events featuring Biomimetic innovator and entrepreneur, Jay Harman. A public lecture on the evening of October 7, 2013 held at PNCA attracted more than 250 attendees. Inspired by nature’s flow geometries, Jay Harman has designed more efficient industrial equipment, including refrigeration, turbines, boats, fans, mixers, and pumps, and is the founder of several companies to bring these products to the market. Harman shared his infectious enthusiasm and war stories that propelled him to create nature-inspired innovative products that have made him a pioneer in bio-inspired sustainable technologies. Harman said, “Nothing short of the overhaul of the entire industrial sector is possible” and he strongly believes that Biomimicry holds great promise. Harman shared some of the challenges he and his team at PAX Scientific have faced in bringing new technologies to market in established industries such as boating, refrigeration, and water treatment. 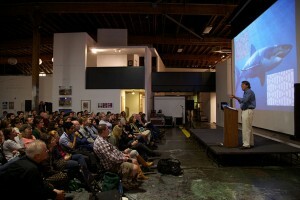 The second event held on October 8, 2013 was an informal conversation between Jay Harman and Chris Larson of Biomimicry Oregon, at PNCA’s Collaborative Design graduate program studio space. This event attracted roughly 30 people. Jay Harman’s faith in Biomimicry and unshakable perseverance seemed apparent from the engaging dialogue that spanned for an hour and half. Jay’s boyhood fascination and love for the sea led him to question how nature creates boats. He spent hours swimming and skin diving, which sparked his interest through deep observation of nature’s patterns of fluid flow. He was obsessed with spirals and reverse engineered the geometry of the spiral shape which underlies all fluid flow. Harman mentioned a few qualities he and his business and life partner, wife Francesca Bertone, observed in the other Biomimics they interviewed. Often entrepreneurial Biomimics exhibit a trait of “resolute stubbornness.” They hold a deep conviction that they can make a difference and do not take no for an answer. Sometimes a bad experience triggers the entrepreneur. In Harman’s case, the death of a friend’s son riding on the bow of a boat who fell overboard and was killed by the propeller. This event set Harman on course to invent a propeller whose form is inherently safe. Harman spoke about the importance of finding “patient capital,” noting that most funds raised to develop his products had been from private investors with a long-term horizon. Harman was convinced that his innovation would work if he would accurately follow nature’s pattern rather than try to improve on it. Harman’s final remarks were to the Collaborative Design graduate students to follow their passion in whatever fascinated them, as he believes that fascination is a strong influencer to actualize one’s dreams. 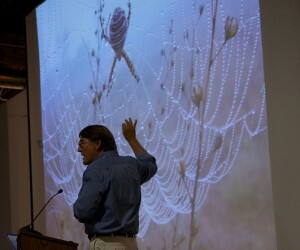 Jay Harman recently published a book, The Shark’s Paintbrush: Biomimicry and How Nature is Inspiring Innovation. The book features dozens of Biomimicry case studies as well as chronicles Harman’s own entrepreneurial journey from his inspiration of nature’s systematic design to successful implementation of efficient industrial devices.